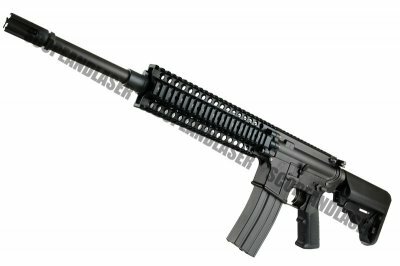 The newer Electric blowback system introduce by Marui not so long ago is becoming a new standard as this version attests; with some pretty externals including fully licensed Daniel Defense components, markings and yet a few differences as well it still makes use of the same blowback internals and the same special magazines. 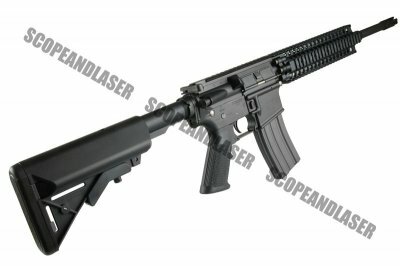 With an M4A1 16 inch outer barrel it has the potential to hit the sweet spot size of mid to long range outdoor shooting accuracy. 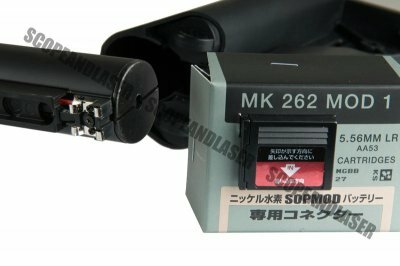 With the newer hop-up unit it will shoot with greater stability and control and the new battery style it should be more electrically reliable as well; just like the SOPMOD M4 where it was first used. This weapon does not come with a battery but it does have a charger. 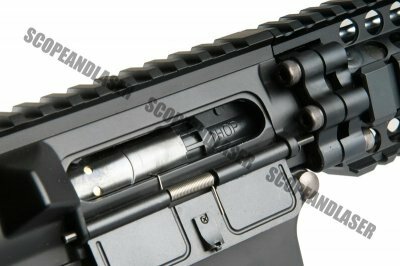 Just like the original SOPMOD M4, with an empty magazine in the weapon a fired shot will result in a "bolt locked" mode which prevents further firing until either a loaded magazine is inserted or the bolt release catch is pressed. 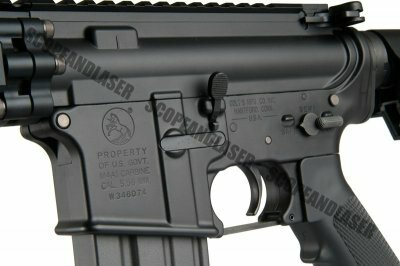 The 9 inch rail system is Daniel Defense style (fully licensed by Daniel Defense USA) which is not only damn fine looking but very practical; the bolts hold the rail on more securely then simple delta attach types and the nice deep top and bottom rail setups are good for compatibility with deep set mounting grooves such as those found on some grenade launchers. Coming with no sights at all, those 15 inches of rail top are begging for it. Whether iron sights or electronic, reflex or telescopic; check around our website and find something to suit your personal proclivities. This is probably the most high end offering from Marui to date and has the quality and performance to boot!